Using our exclusive Footwear Fit Process, we guide runners and walkers through an extensive fitting process that ensures a proper fit. Below is a step by step walk through of the process that we use to make sure you are fitted into the best shoes, socks, and inserts for you. No appointment necessary, but please allow extra time when you come in for your Personal Fit. Step One: Welcome and Explanation of The FIT Process - Fitting you begins with a hello and an explanation of the Footwear FIT Process. Step Two: Getting to Know You - We like to take time to ask questions about your current fitness activities and goals. Also, we like to know about any existing or past injuries, and talk about the footwear you currently use. We'll then have you take off your shoes and socks so that we can take a closer look at your feet. We aren’t doctors and don’t pretend to be, but we take a look at your feet in order to fit you properly and determine any special needs. Some things we look for include blisters, black toe, hammer toe, callouses, bunions, as well as other foot problems. We also look at arch height, foot width, heel width and other foot characteristics. 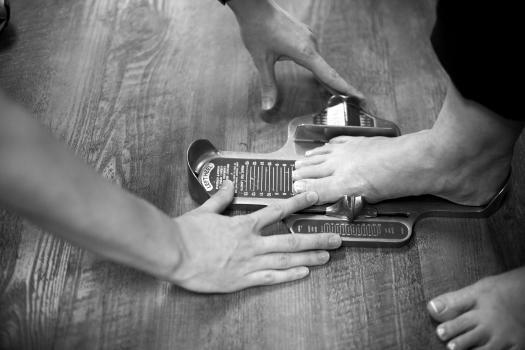 We find this step to be one of the most valuable aspects in fitting shoes. Step 3: Gait Analysis - We watch you walk barefoot so that we can see the natural bio-mechanics of your foot and lower leg. We do not want to mask this by having you wear shoes, we need to see what the foot is doing. This part of the process will help determine what category of shoe may work for you. 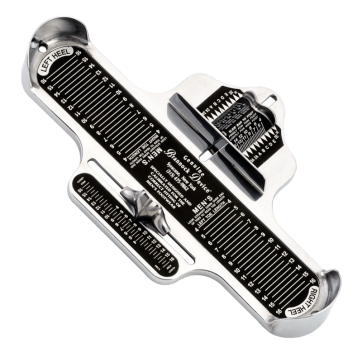 Step 4: Measurements – Using a Brannock device, we take multiple measurements to help determine fit. We measure your foot while you are seated first because this is where your foot is aligned and unweighted. Then we measure your foot standing (weight bearing) to see how much flexibility your foot has. These measurements can give us clues as to what may cause injuries due to straining or misalignment. This part of the process allows us to choose specific shoes based on the shape of your foot and last of shoes. Taking these measurements this way is crucial to proper analysis. Something machines can’t determine yet. Step 5: Fitting and Recommendations - Based on our findings, we will bring out shoes that may work best for you. We’ll carefully inspect the fit of the shoe and watch as you run or walk. We’ll discuss other options, provide you with our recommendations and answer any questions. Step 6: The Decision - You are the only person who knows how the shoes actually feel, so we work together to find a shoe you will be happy with. Step 7: Completing the Process - Once you have found shoes, socks, and inserts that work for you, we can answer any other questions you may have about training, nutrition, or apparel. We offer a FIT guarantee so that you can have the confidence in our choice and know that Fleet Feet Sports is going to make it right if you are not happy. We want to send you off on the right foot (and in the right shoe).